Screen Enclosure, Sunroom & Lanai: Elegant Home Addition in Fort Myers, Florida - Appreciate the outdoor surroundings with the aid of screen enclosure. Get the best and trusted contractor of enclosure construction to enjoy the year round sunshine weather in Southwest Florida. Appreciate the outdoor surroundings with the aid of screen enclosure. Get the best and trusted contractor of enclosure construction to enjoy the year round sunshine weather in Southwest Florida. Adding a screen enclosure allows you more space and options for your home in Fort Myers, Florida. Not only does it increase your home’s resale value, but the screen allows for a breeze and a more open feeling to infiltrate your home. If your patio contains a roof, you can enjoy your outdoor space on rainy days as well, and even use it as an area to entertain family and friends. For those who have indoor pets, but want to give them a taste of the outdoors, a screen enclosure can provide the perfect opportunity. Keeping your pets inside but allowing them to go freely between your home and the enclosed pergola, alfresco or patio will allow them some of the feelings of being outdoors, while also keeping them protected. For most people, their love of the outdoors usually ends at the bug factor. Eating outside often becomes a hassle, when flies take a seat at your table. Staying safe from these and other pests is something that has many concerned and basically held up as prisoners in their home. With a screen enclosure by Fabri-Tech, you can safely enjoy the outdoors again, and do it truly bug-free. Let’s face it. In Florida, we have some pretty hot summers. Screen enclosures create a comfortable shaded space for you to enjoy the outdoors. Screened in patios, lanais and sunrooms also act as a protective layer from the sun, filtering the sun’s rays and decreasing the possibility of developing skin cancer or getting heat stroke. Contrary to popular belief, a sunroom doesn’t have limited use. It will be as good as the other rooms after it’s fitted with window covers. Apart from a bigger living space, many want a house that can let a lot of natural light in and this is not solely for aesthetic purposes. The idea is, the more natural light gets in, the more you wouldn’t have to turn on the lights, which saves energy. Nearly everyone with a sunroom pays for the landscaping outside of it. It only makes sense because, with all that glass, you’re going to want to see something beautiful outside. Perhaps you’re thinking this is another burden on the wallet, but you need to evaluate that a bit. A sunroom might seem like a luxury, but the cost for one with Fabri-Tech can be reasonable. Turning a very large room into one, is of course, a different story. The good thing is that you can pick something simple or go all out, depending on your budget. This also makes a good playroom for kids or grandkids or a lounge you could curl up into. Whether you’re reading, crafting or exercising, you can always modify the room to suit your needs. Don’t forget that this is not fully insulated, so it’s best to enjoy it during warm months or at least until it isn’t freezing cold. It is fun to have a sunroom, and don’t forget to make a few considerations. Take note of the cost for the maintenance as well. At Fabri-Tech, our focus is to make your outliving living area a place which becomes an outdoor sanctuary for your family. That might be keeping out the pests, like snakes, rubbish and leaves. Create a wonderful space you want to spend time outside in the fresh air, entertaining and enjoying. Call us at 1-800-281-1289 or 239-772-9825 now. Fabri-Tech’s Design and Construction Team will gladly come to your home or business in Marco Island, Bonita Springs, Naples, Fort Myers, Cape Coral, Port Charlotte, North Port, Venice, Estero, Punta Gorda, or Lehigh Acres to offer you a non-obligation design quote. Fabri-Tech’s design team is customer-oriented and will mindfully assist you in creating an expanded outdoor living space for you to enjoy. Why do all Outdoor Pools in Southwest Florida have Screen Enclosures? 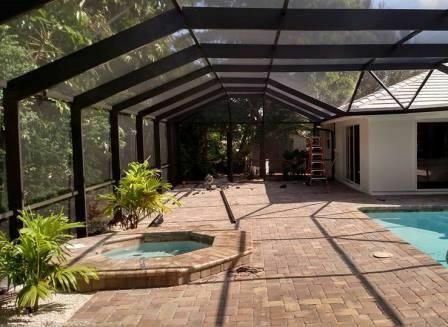 Screen Enclosure in Florida from Fabri-Tech protects your pool or outdoor area from bugs, leaves and debris while allowing fresh air and natural sunlight to shine through the fiberglass mesh. Aluminum fabrications greatly improve and enhance every structure and equipment with this material. It offers various advantages which are beneficial to homeowners and commercial. How to Improve your Home or Commercial Property Driveway in Marco Island, Florida? Concrete additions will greatly improve your driveways and enhance your walkways in your outdoor space. Partner with Fabri-Tech team to achieve the decorative design & quality workmanship you wanted. Aluminum canopies from Fabri-Tech Screens add to the architectural beauty of a building instead of making an extension of concrete over windows and doors. Aluminum railings come with great qualities that no other material can equal. It doesn’t require any of the costly and time-consuming maintenance tasks. Residential Swimming Pool Safety Fencing makes your swimming pool more interesting place to spend your time around. A Life Saver Pool Fence® is a removable mesh pool fence & convenient safety barrier. Fabri-Tech being in business since 1985. Expert in pool enclosure fabricators, build pool cage design and construction, pool safety fences, screen enclosure repair, sunrooms and lanais, and concrete.